Final preparations are being made for the signing of the historic nuclear disarmament pact START between Russia and the US in Prague on Thursday, April 8. 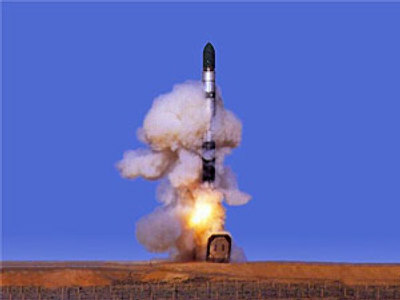 One of the main hopes is that it will encourage other nations with nuclear weapons to reduce their arsenals as well. After months of debate and negotiations it seems that the wait is over and on Thursday Presidents Dmitry Medvedev and Barack Obama will put pen to paper and formalize a new START treaty. “The United States and Russia are completing negotiations on the farthest reaching arms control treaty in nearly two decades,” Obama announced. At the height of the Cold War it was estimated there were nearly 40,000 nuclear warheads deployed worldwide. 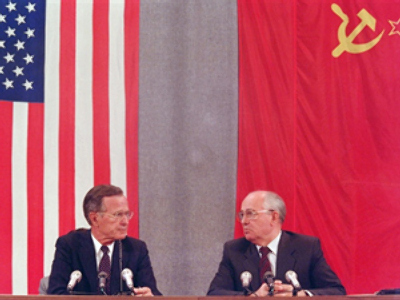 The original START treaty, signed in 1991, aimed at reducing the arsenals of the US and the USSR to 6,000 each. START I expired last December, and since then, the world has been looking to the two nuclear superpowers to take the next step. The new agreement plans an unprecedented reduction to only 1,500 warheads each, a move that some hope will be an example to the remaining nuclear powers. “I think the signing of this treaty is very important and I have no doubt that it will be an important step in the direction of making the world safer. It will be the beginning of a process in which the diminishing of nuclear weapons will continue,” noted Javier Solana, EU foreign policy chief from 1999-2009. In the past much of the focus of the START treaty has been on reducing delivery systems, but now there is a new twist in the START agreement linking strategic missile offense to defense. "The legal juridical linkage in the text of the treaty means that in case the US does something unilateral in order to strengthen their defensive potential – increase the number of interceptors, introduce other radar stations somewhere nearby and so on and so forth – in case they improve their defensive capacity, that would mean that the balance has been damaged and that Russia has a legal right to get out of this treaty again and to take some additional measures to compensate for that unilateral development,” clarified Konstantin Kosachev, the head of Russia’s State Duma Foreign Affairs Committee. The idea of an American missile defense shield in Russia's back yard has been one of the key points of contention in the new start agreement, but by connecting offensive and defensive capabilities it seems a compromise has been reached that can make both countries happy. A treaty billed as a "new start" between two countries paving the way for a future that could see a world free of the threat of nuclear war. Russia's deputy Foreign Minister, Sergey Ryabkov, told RT the new treaty reflects a different level of trust between the two nations. “Control but trust – this is the essence of the philosophy in the area of verification which was implemented in this treaty. We have a leaner, a more effective treaty, less heavy in terms of bureaucratic intricacies and more built upon a mutual trust, really acquired by the parties over the years since the Cold War ended,” Sergey Ryabkov stated. “We have a system of verification that will allow us to check when it is necessary to do so to be sure that nothing goes undetected, but at the same time we have never intended to build a system even closer to the one that was in place when the Cold War-type of relationship dominated our arms control agreements with the US,” he concluded. With the START treaty, Russia and the US will have more “moral right” and international public opinion on their side, told RT Professor Evgeny Bazhanov, the vice-president of Russia's Diplomatic Academy. This will help to convince other countries with existing or planned nuclear capabilities to change their nuclear policies and slash nuclear arsenals. Meanwhile President Barack Obama has unveiled a new American nuclear policy, ahead of signing the START treaty. Hillary Clinton and Defense Secretary Robert Gates explained that it would narrow down the circumstances under which the US would use nuclear arms. But the President warned that countries breaking international rules would remain potential targets.